You can make a ring pillow from virtually any fabric or material you like. 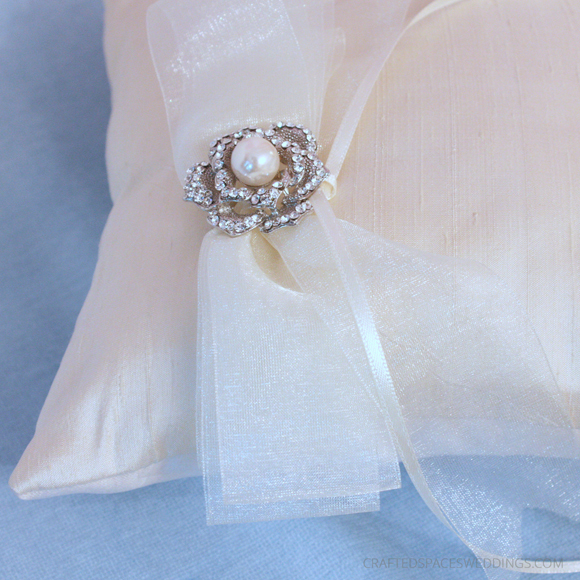 However, your ring pillow should match the theme of your wedding. Select colours, fabric, ribbons, and other embellishments that compliment your wedding. Another consideration is the size of your ring bearer and selecting a pillow that is easy to carry. Your ring pillow can be any shape you choose, so do not think that you are limited to using a square ring pillow. Having said that, most ring pillows you will find will be square and measures 6 to 9 inches on average. A ribbon or decorative cord is commonly used to attach the rings. You will also find other decorative elements such as flowers, brooches and buttons. 1. Cut two pieces of fabric to your desired size (between 7 - 10 inches square). Pin your fabric together with right sides facing each other. 2. Using a 1/2 inch seam allowance, sew around the edges of your square, leaving a 3 inch opening in the centre of one side. 3. Clip the corners at an angle and turn the pillow right side out, press and fill with fiber fill to your desired firmness. 4. Close the opening with a slipstitch or use your sewing machine. 5. Fold your ribbon in half and using a needle and thread attach to your pillow, along with any additional embellishment you have selected. 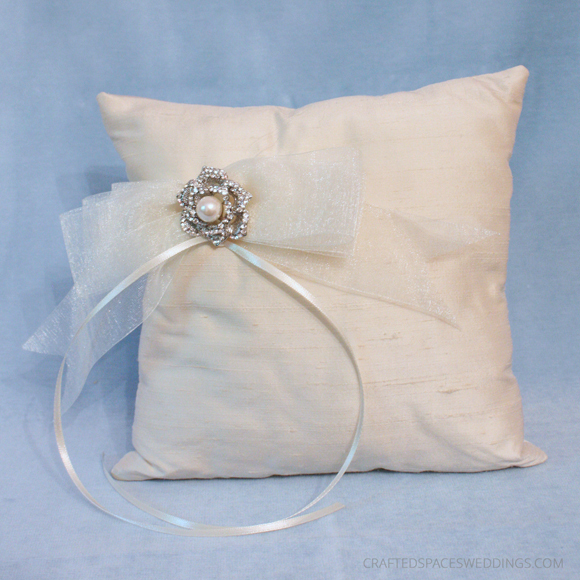 As an alternative to other embellishments you can wrap a large ribbon around your ring pillow and tie a large bow. 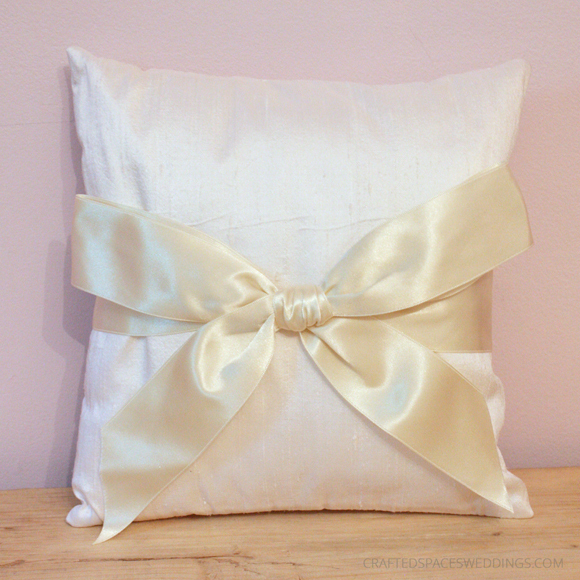 The ring pillows featured in this tutorial is made from 100% silk dupioni (font and back) and a combination of 100% silk dupioni with 100% polyester satin backing. My finished ring pillows are 8 1/2 x 8 1/2 inches square. I used a combination of organza ribbon and double sided satin ribbons. 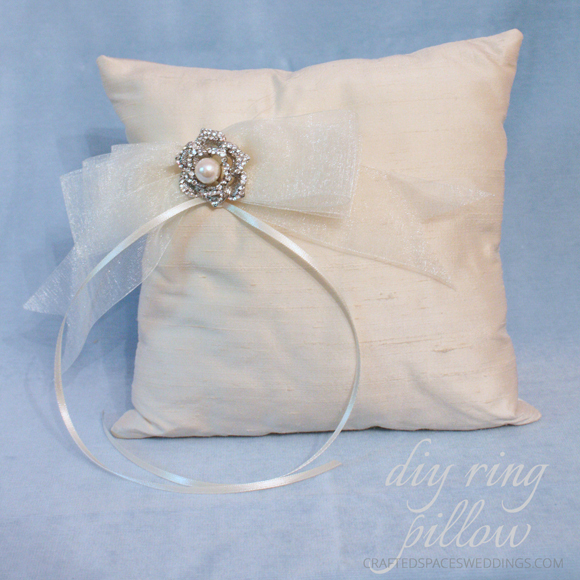 Here is another Ring Pillow Tutorial that you may like. This tutorial uses tulle in combination with organza and satin ribbons. Don't feel like making your ring pillow yourself! 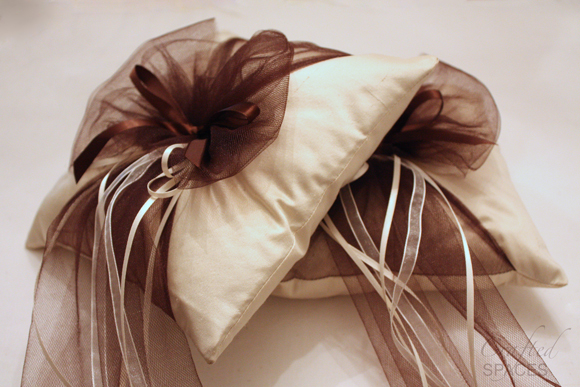 Order a custom ring pillow; contact us at hello@craftedspacesweddings.com.